(Portland, Oregon) – Hundreds of thousands of people around the Portland metro area gathered to watch massive Fourth of July fireworks displays Monday night, from Vancouver, Washington to the outskirts of the area in satellite communities like Canby, Beaverton, Lake Oswego and Gresham. 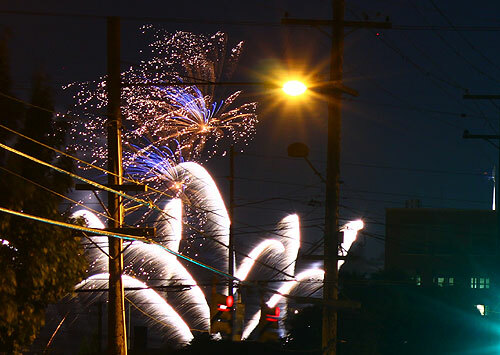 Tens of thousands gawked at the fireworks display from the Waterfront Blues Festival, shot off from the river – though folks watched from vantage points along the east side of the Willamette and neighborhoods and local watering holes in even larger numbers. From a slightly awkward viewpoint of the Hawthorne District, about 11th Street, the show was still impressive. OregonTravelDaily.com had staff lingering there and captured some striking time lapse photography of the show, in tandem with the traffic along the streets, as well as video of the scene. Most interesting here is watching the half moon sink quickly in the time lapse portion of the video over a period of mere seconds – seen in the far right hand corner. 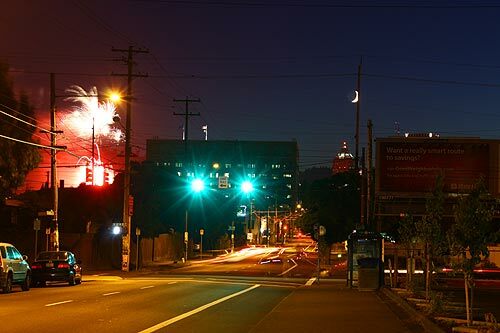 The streaks of eastbound vehicles, the traffic lights and street lights create enough of a beautiful combination by themselves, but the subtle sight of that moon moving in the sky is especially engaging.